Past issues of Forum. Clockwise from top left: & other lovely insects (1976), (no title, 1972), Reality Trip (1973), Double Mirage (1975). The English Department at City College of San Francisco holds 35 past issues of Forum, the earliest issue dated 1948. Upon request, these issues are available but cannot leave the office. 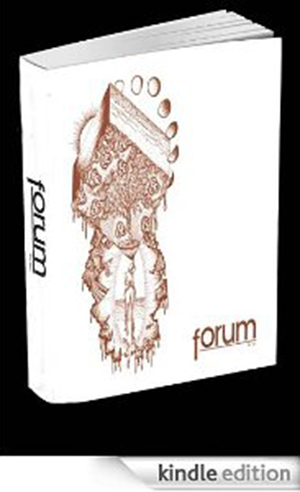 During the 1970s, Forum was renamed with individualized titles: Reality Trip (1973), Double Mirage (1975), & other lovely insects (1976), and Undertow (1977, 1978). In Double Mirage (1975) visual art was creatively incorporated with decoratively drawn frames, hand-drawn typeface, and full-page sketches accompanying text. Student editors have fiddled with Forum‘s style for decades, building a legacy of unique perspectives. Forum can better preserve past issues with digital archiving. Traditional archives localize physical content, whereas digital archives have no bounds. Ensuring that voices of past authors are heard would continue Forum‘s mission to give voice to the talented authors, poets and visual artists in our community. I need a black leather jacket. I need the Ozone Hotel. I need the Rolling Stones and drugs. I need all those hungry friends. I wanna be available cheap. riding the highest crest of the sea. “Greedy,” by Ann Nelson Gleeson originally published in Double Mirage (1975, City College of San Francisco). Non-Fiction and Visual Art Contest!